Eschewing their customary full-on 3D glory for something a little simpler, creative slot developer Betsoft Gaming’s take on the classic Egyptian theme – Pharaoh King – is the perfect game for those who like their slots with a little less fuss. 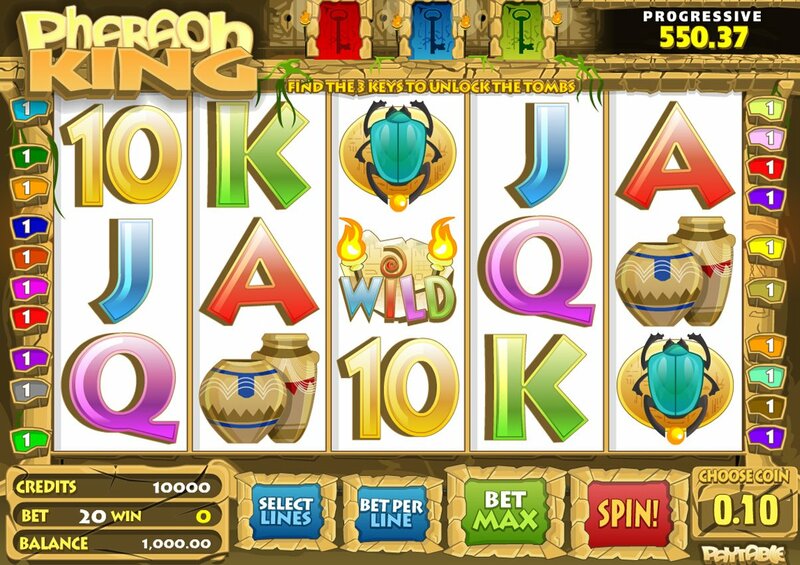 A 5-reel, 20-payline slot with coins ranging from $0.02 to $1.00, Pharaoh King carries some no-nonsense 2D graphics, some nice casino-esque jangles as you spin the reels, and a basic Egyptian motif when you hit a winning combination. At face value, this might appear to be just another run-of-the-mill Egyptian-themed slot but it is worth sticking around and giving this slot a bit more time due to the bonus features available. Not only that, but there’s a Progressive jackpot to be won too if you hit five scarab beetle icons across the reels when playing at the maximum stake. On the reels, as well as our friendly blue scarab, we get wicker baskets, pyramids, and multicolored 10-through-Ace symbols. The Wild icon is, understandably, the game’s Wild, substituting for all regular symbols other than the Scatters. Five Scattered pyramid icons, meanwhile, triggers a 10,000-coin jackpot. It won’t trigger any bonus rounds, however; that honor falls to the keys. Collect three keys – one red, one blue and one green – on the reels and you’ll unlock the game’s bonus round. You can see which keys you’ve collected at the top of the base game screen. It’s just as well that found keys stay in place while you hunt for more, as I found it incredibly hard to collect all three in order to trigger the bonus. Once you do get there, however, you’ll be taken to a second screen bonus round that takes place in a tomb featuring six different urns. You’ll be prompted to click on the urn of your choice, which will reveal a prize of instant bonus credits. You can continue clicking on urns to reveal more prizes until you open one that includes the word “collect,” which signals the end of the game. 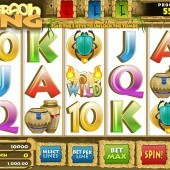 Although never going to compete on the looks front with some of Betsoft’s 3D offerings, Pharaoh King certainly delivers on the simple slots front. For more simple Egyptian frolics, head for NetEnt’s Egyptian Heroes game, or Sheriff Gaming’s Pharaoh’s Tomb slot which treads similar adventure-themed madness.